This is my latest HIIT workout. I based it on my experience that you work harder when you have to keep moving between completing exercises on the floor and standing, so I coupled eight floor exercises with eight off-the-floor exercises. And it worked, it really worked! I warmed up with 5 minutes on the treadmill and a 500m row in 2 minutes. 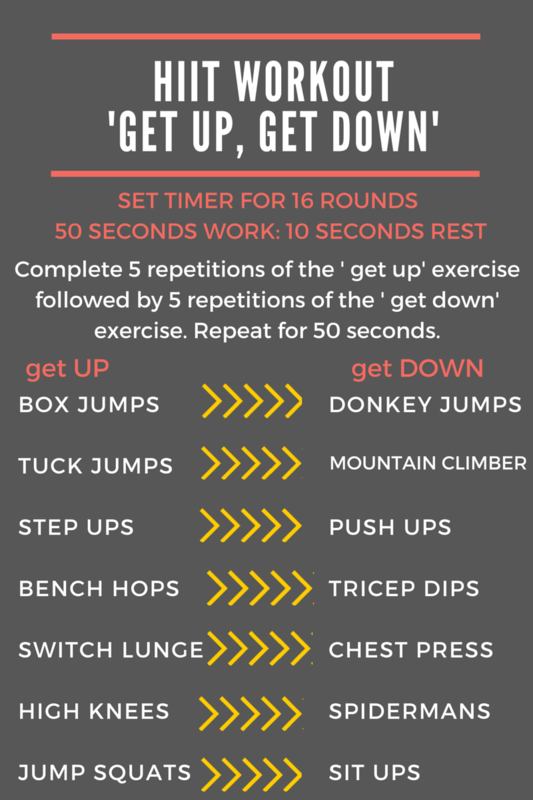 I then completed two rounds of my 'Get Up, Get Down' HIIT workout. I followed this with a short tabata session using a 17.5kg barbell focusing on upper body exercises. (Upright row, clean and press, push press, squat, bicep row and wide row - 2 rounds of 20 seconds work, 10 seconds rest). I finished with a third round of the HIIT workout. I had planned on doing a forth round but my form was getting pretty average after the third so I quit while I was ahead! I completed this workout at the gym, but as it requires limited equipment so you could easily do it at home, you just need to find a high step (for box jumps and step ups), a chair (for dips and bench hops) and a weight (for chest press). You need to set a timer for 8 rounds of 50 seconds work and 10 seconds rest. You complete 5 repetitions of the first exercise and then you complete 5 repetitions of its paired exercise and continue to repeat this for 50 seconds. i.e. 5 box jumps, 5 donkey jumps, 5 box jumps, 5 donkey jumps etc. So now you just need to set those timers and away you go! I'd love you to share your favourite HIIT workout with me! Hope you did, if not I double dare you to try it tomorrow! I need to get back into my morning exercise routine. Need to!!!! This looks like a good place to start! Did you start? Have you worked out your daily routine yet now that you are working from home? It can get tough trying to keep the variety and interest going when you are pregnant. You might like to give my 8 week HITT with a BITT (baby, infant, tot, toddler) series a go when you have your bub, until then keep at it! !